New Brunswick, N.J. – Lung cancer is the leading cause of cancer death in both men and women. Lung cancer diagnoses have more than doubled among females in the past 38 years, while having fallen 29 percent among males, according to the American Lung Association. Aiming to better understand gender differences in this disease, Rutgers Cancer Institute of New Jersey radiation oncologist Sharad Goyal, MD, is embarking on new research supported by an inaugural $400,000 LUNG FORCE Research Innovation Project: Lung Cancer in Women Award from the American Lung Association. The work will explore whether radiation exposure from interventional cardiovascular procedures leads to increased risk of lung cancer in women as compared to men. 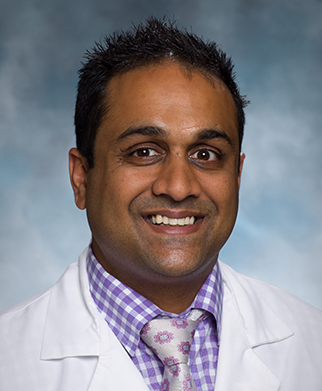 As part of the work, Goyal will examine data from two statewide databases: the Myocardial Infarction Data Acquisition System (MIDAS) and the New Jersey State Cancer Registry (NJSCR). MIDAS is housed at the medical school’s Cardiovascular Institute, while NJSCR is housed in the New Jersey Department of Health and Rutgers Cancer Institute. In examining a cohort of nearly 800,000 patients exposed to ionizing radiation during specific heart procedures and more than 3.2 million unexposed patients, Goyal aims to define meaningful estimates of gender specific risk to developing lung cancer following radiation exposure. “As both diagnostic and therapeutic radiotherapy are used more and more, a potential link between ionizing radiation and lung cancer needs to be thoroughly explored so that patients will better understand the impact of these technologies and what their potential risk may be. We are pleased that the American Lung Association has recognized Dr. Goyal’s expertise as both a radiation oncologist and clinical researcher and is providing him with an opportunity to carry out this very important work,” adds Rutgers Cancer Institute Interim Director Bruce G. Haffty, MD, who is also professor and chair of the Department of Radiation Oncology at Rutgers Cancer Institute, Rutgers Robert Wood Johnson Medical School and Rutgers New Jersey Medical School. The LUNG FORCE Research Innovation Project: Lung Cancer in Women Award is funded through the American Lung Association’s LUNG FORCE initiative, which raises awareness of lung cancer incidence in females and provides funding for lung cancer research. Rutgers Cancer Institute is the Signature Sponsor for the LUNG FORCE initiative in New Jersey. American Lung Association National President and CEO Harold P. Wimmer says this type of support underscores the organization’s mission. "More women than ever are dying of lung cancer, and in order to save lives - we need to understand why. The American Lung Association is committed to investing in promising lung cancer research, as well as research focusing on asthma, COPD, pulmonary fibrosis and other lung diseases. Funding medical research is at the core of the American Lung Association's mission to save lives by improving lung health and preventing lung disease,” he notes. Rutgers Cancer Institute of New Jersey (www.cinj.org) is the state’s first and only National Cancer Institute-designated Comprehensive Cancer Center. As part of Rutgers, The State University of New Jersey, the Cancer Institute of New Jersey is dedicated to improving the detection, treatment and care of patients with cancer, and to serving as an education resource for cancer prevention. Physician-scientists at the Cancer Institute engage in translational research, transforming their laboratory discoveries into clinical practice. To make a tax-deductible gift to support the Cancer Institute of New Jersey, call 848-932-8013 or visit www.cinj.org/giving. Follow us on Facebook at www.facebook.com/TheCINJ.